When you have an old building you have things that are abandoned. I had a chance to take some oddball pictures and this particular closet caught my eye. 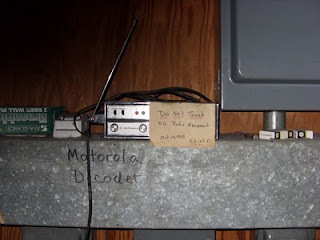 I couldn't tell if it was still plugged in or turned on but there it was, sitting on some metal shelf, and old Decoder for the Fire Department. That would be when we had a Fire Department, and probably back when we had a generation of Fire Radios back... or more. This was in City Hall, in a little utility closet next to the offices, tucked away near the Commission Chamber. I do not doubt it still works after a fashion, but probably turned off and left there forlorn. Old electronic equipment fascinates me. It it is truly old, you'll see the good stuff with Vacuum Tubes, but you hardly see any of that any more, even in a thrift shop. This was installed before October 13, 1983 and left there ever since. The Fire Chief would be happy to know, if he were still around, that his radio outlasted the building. Well, Motorola did and does build good equipment.